Gone are the days when sportswear was primarily associated with convenience. Today, our sporting heroes are as glamorous as our screen idols- and that's true in a case of both on and off-field/court endeavors. Needless to say, much of the glamour that we associate our athletes with has a lot to do with the clothes that they wear on the field or on the court. Sportswear, through the years, has undergone several changes. Regardless of whether it is cricket, tennis, soccer, rugby or any outdoor sports- jerseys have changed a lot over the years. Both technological advancement (as far as manufacturing these jerseys is concerned) and fashion have actually gone on to play a role in heralding this change. Find out more. Comfort, needless to say, is at the heart of jersey manufacturing today. Thanks to the progress of modern technology, today you have these sweat-absorbent jerseys that are worn on warm and humid days. These jerseys are particularly used in high voltage sports such as cricket and soccer so that for players beating the sticky summers is a breeze while they're playing. What more? They offer you heightened mobility on field as well. Today, a lot of thought goes into determining the color of the jerseys as well. When you're a part of high voltage sporting activity like soccer, rugby or cricket, the team management will definitely want you to sport very bold and bright colors on field. The bold jersey is just a manifestation of your team's aggression. It's like a psychological weapon against your opponents. Not every team in every sport may try out this particular psychological hack but you may come across several coaches who continue to fall back on bold (but fashionable) jerseys to shore up mind games of teams. Women sportswear demands special mention as far as fashion is concerned. Today, they are not only comfortable but funky, cute and trendy as well. Please ensure that you are looking for credentialed sportswear manufacturers in your town. Don't end up settling for the services of manufacturers and suppliers that have not really been able to garner positive reviews in the market for the quality of products offered by them. There definitely are certain factors that help you be sure about the credentials of a company. You can start off by reading the reviews of the manufacturers and suppliers. What are their clients saying? Are they satisfied with the quality of products made available by these manufacturers? Are they looking forward to collaborating with these brands for their needs further in the future? Or, are they completely annoyed with the products delivered by these suppliers? Have they cared to clarify the reasons behind their feelings for these brands? Do seek personal recommendations as well. Ask your peers if they can recommend a brand or not. Zeroing in on a brand has to do a lot with these considerations. 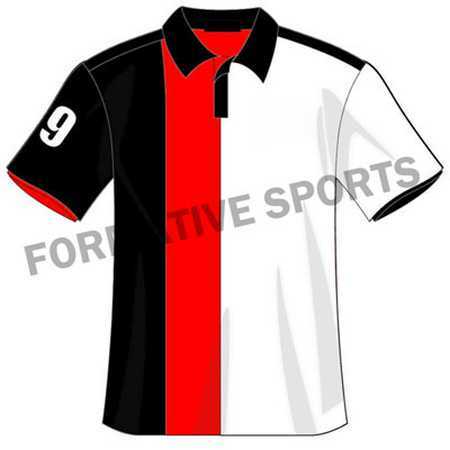 Formative Sports is highly appreciated in the international market as noteworthy Sportswear manufacturers. We are offering our range in attractive designs and shades. Contact us to get custom team sportswear at competitive rates.